Just a 20-minute walk from the Diavolezza top station is the beginning of the more demanding variant of the via ferrata on Piz Trovat. Its level of difficulty (K5-6) requires considerable strength and stamina, and long overhangs of up to 30 metres mean that sound mountain climbing skills are a must. Around halfway along the route, shortly before the rope bridge, the trail splits in two, with the new branch of the Y-shape leading up to the summit at 3,146 metres above sea level. From here, you can enjoy a sensational panoramic view of the furrow-edged Pers Glacier, the highest mountains in the eastern Alps and the icy peaks of the Bernina massif. Piz Trovat II is not suitable for children; young climbing enthusiasts must be at least 1.60 meters tall, as otherwise the hand holds are too far apart. 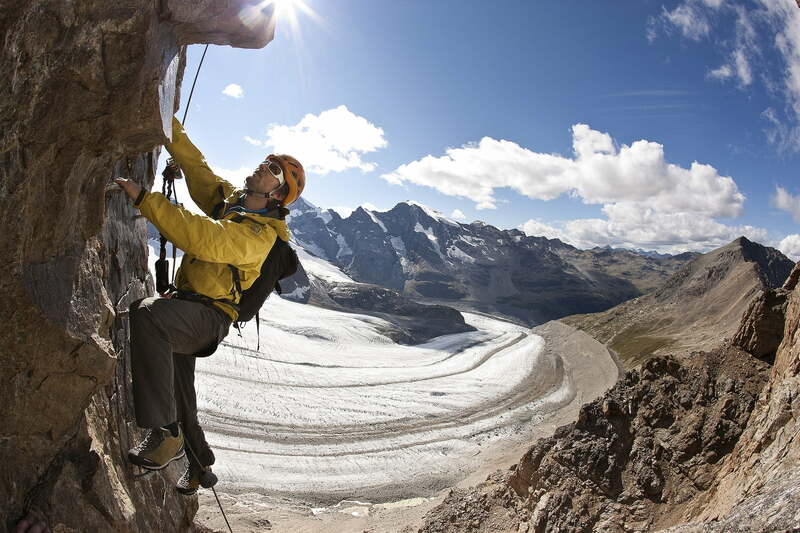 It is recommended to employ the services of a professional mountain guide during the first ascent.